Well, we did this with a few of them. And now I'm going to pass on a recipe to you. A non-bloggy friend (yes, I do have those) passed this one on to me, and after tweaking it a tad bit, I've turned it into a vegetarian's delight! Don't worry though . . . even if you aren't a vegetarian, I'm pretty sure you will LOVE it! I hope to make this for a first course to begin our Thanksgiving or Christmas feast. 1) Saute onions in margarine until tender. 2) Add squash, veggie broth, marjoram, black pepper, cayenne pepper. Bring to a boil, cover and simmer until squash is tender. 4) Return soup to original pan and heat until warm but do not boil. Enjoy with a batch of homemade bread! Yummy! This sounds so good Elizabeth and perfect for fall! The addition of the cream cheese sounds yummy. Can't wait to try it! This sounds delicious! I have a butternut squash pot pie that is to die for, and this sounds right up that alley. 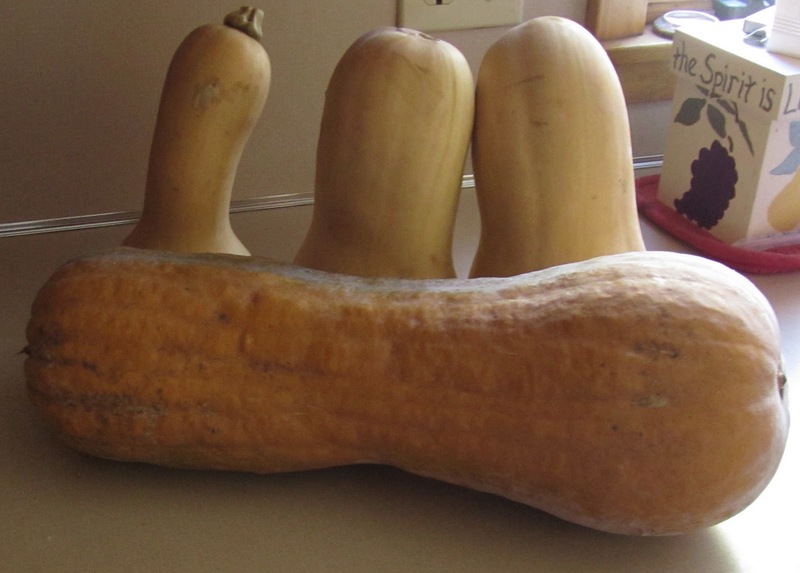 Here's my question: do you have an easy way to peel and cube the dang squash? We just had some Butternut Squash soup tonight, but I felt like it was missing something. Now I know what that was! Lots of yummy ingredients in your soup. Next time I'm going to use your recipe.